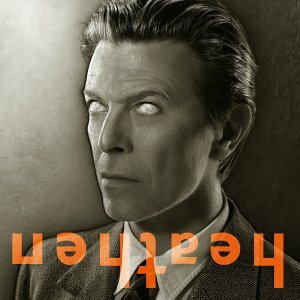 Bonus disc available with Limited Edition pressings of David Bowie's "Heathens"
Heathen marks a new beginning for David Bowie in some ways - it's his first record since leaving Virgin, his first for Columbia Records, his first for his new label ISO - yet it's hardly a new musical direction. Like Hours, this finds Bowie sifting through the sounds of his past, completely at ease with his legacy, crafting a colorful, satisfying album that feels like a classic Bowie album. That's not to say that Heathen recalls any particular album or any era in specific, yet there's a deliberate attempt to recapture the atmosphere, the tone of his '70s work - there's a reason that Bowie decided to re-team with Tony Visconti, the co-producer of his best records from Ziggy to Berlin, for this album - even if direct comparisons are hard to come by. Which is exactly what's so impressive about this album. Bowie and Visconti never shy away from electronic instrumentations or modern production - if anything, they embrace it - but its woven into Bowie's sound subtly, never drawing attention to the drum loops, guitar synths and washes of electronica. For that matter, guest spots by Dave Grohl and Pete Townshend (both on guitar) don't stand out either, they're merely added texture to this an album that's intricately layered, but always plays smoothly and alluringly. And, make no mistake, this is an alluring, welcoming, friendly album - there are some moody moments, but Bowie takes Neil Young's eerie "I've Been Waiting for You" and the Pixies' elusively brutal, creepy "Cactus" and turns them sweet, which isn't necessarily a bad thing, either. In the end, that's the key to Heathen - the undercurrent of happiness, not in the lyrics, but in the making of music, a realization by Bowie and Visconti alike that they are perfect collaborators. Unlike their previous albums together, this doesn't boldly break new ground, but that's because, 22 years after their last collaboration Scary Monsters, both Bowie and Visconti don't need to try as hard, so they just focus on the craft. The result is an understated, utterly satisfying record, his best since Scary Monsters, simply because he's never sounded as assured and consistent since. Hopefully, it won't be another two decades before Bowie and Visconti make another record together.